Hello there from library land! I am back with not one, but two books to talk about. 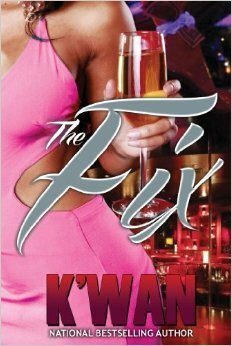 First up is K’wan’s The Fix. If you haven’t heard of K’wan, he is one of the most popular street lit authors out today and rarely disappoints his audience. I admit, however, that I’ve read only one other title by him. Hey, I’m a busy girl. Anyway, I saw this one on the shelf and it caught my eye. The synopsis on the back was interesting, and here we are today with a post about it. The quick rundown: The Fix follows three characters, Persia, Chucky, and Lil Monk. Persia is hood royalty; her father, along with Lil Monk’s father, used to run the hood. After her dad catches a case, Persia and her mom move out of the hood to have a better life. At 17, nobody can tell Persia nothing, as she wants to be back in the hood, proving that she belongs. She gets caught up with Chucky, who has his own agenda with Persia, in addition to his bad intentions for the crew he runs with. Chucky wants to be king and he will stop at nothing to get to the top. Lil Monk, on the other hand, is trying to make a life and name for himself. After Persia’s father was sent to prison and Lil Monk’s mother passed, Big Monk doesn’t have much to live for and Lil Monk is left to fend for himself most of the time. Lil Monk has had a thing for Persia since they were small children. With Persia with Chucky and Lil Monk with his own lady friend, those two having an intimate relationship isn’t in the cards. What will happen to these three after truths are revealed? I was a bit bored with this book in the beginning. Persia’s story isn’t original; in street lit, it’s not new to read a story or ten about the good girl gone bad. Well, Persia’s story isn’t different. What made this book interesting was the details that I caught that really makes me want Kwan to hurry up with a part two so I can figure out what is really going on! For instance, who is Pharoah? I think I know who it is! I also can’t wait to see what will become of Persia and Lil Monk. Will they ever get together or nah? What will happen to Chucky’s snake self? So, all in all, despite the many grammatical errors, I enjoyed this book. This story was fast paced and action packed. I just finished Hell’s Diva: Mecca’s Mission by Anna J. minutes ago. Ok, by the time I post this, it will be a day or so later, but whatever! This is my first novel by author Anna J., and apparently, this book was first published in 2010. I am very late! Despite my lateness, I saw this book on the library’s list of new books to arrive and decided to give it a try. The quick rundown: This novel begins with Mecca being shot and transported to what she thinks is Hell. Lou, the long robed wearing figure, transports Mecca back through her past to show her all of her wrongdoings. After Mecca’s parents were murdered, she moves in with her aunt Ruby and embarks on a life of crime. Ruby is a big time drug dealer, despite being a woman, who is quick to pull her gun and take out anyone who stands in her way. After Ruby is removed from the picture, Mecca steps up to the plate to keep the business going. However, in street life, no one is loyal, as Mecca realizes while Lou shows her how she was betrayed by those she loved. What will Mecca do now that she knows the truth? Will she return to her old ways or let karma do its job? I didn’t know where we were going in this book and almost wrote it off as yet another street lit book. I was wrong! This fast paced book was easy to read and full of lessons. I went ahead and requested that the library buys the follow-up because I MUST know how this story is going to end! One thing I didn’t like was having to know everything they wore. I got it. They were making money in the drug game. It was a bit too descriptive and became annoying to me after a while. Other than that, I highly recommend this book.